The Giants pass-rush has been virtually non-existent so far this season, but Robert Ayers was creating havoc in the Colts backfield on Monday night. Will the defensive end's stellar play continue in Week 10 against the Seattle Seahawks. When the Giants have reigned supreme in their past success, most of it has come from the likes of their defensive line causing unheralded havoc on to opposing quarterbacks. As the Giants know from their two Super Bowl victories, everything starts up front. However, in the past few seasons, the Giants have sort of lost their identity, and have grown away from their roots, losing the team’s pass rush, which has also lost them more games as well. However, in this past Sunday’s loss vs. the offensively gifted Colts, we saw a silver lining and glimmer of hope in the G-Men. The defensive line is beginning to shape up as an intimidating unit for the club once again. 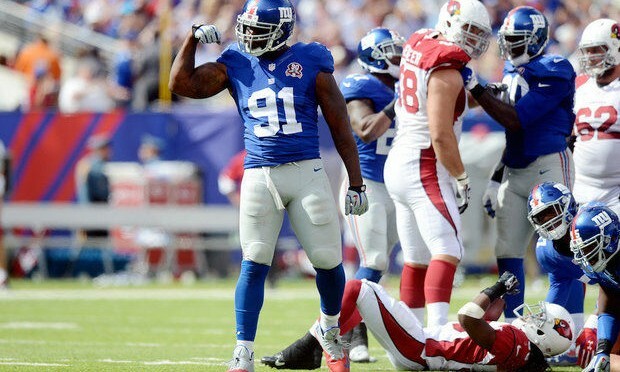 Highlighting the unit Monday was the performance of Robert Ayers. Ayers, the former first round draft selection collected a sack and numerous hits on quarterback Andrew Luck. When asked to speak about his performance and what had changed, Ayers was humble about his breakout performance. The Giants are optimistic that Ayers and the rest of the unit can continue to improve. If the team wants to have any shot at competing against the reigning Super Bowl champs, it will be up to Ayers and company to improve on their past performance. When Ayers was asked about how he will face off against Russell Wilson, he was critical of his own play Monday night. If the rest of the Giants defensive line can play like Ayers did this past Sunday, there remains hope that the team still has playoff sights intact, and a win this upcoming Sunday would be extremely crucial to the team’s playoff hopes.